This is a Netflix production so I imagine it will be available to stream for the duration. I thought Liz Garbus did a nice job turning this tangled life into a narrative that worked for a movie, although clearly she cut out a lot. It wasn't until I started googling after watching that I wondered what Nina Simone's siblings would have said about her. It didn't touch on the relationship with her nurse and manager Clifton Henderson that apparently is the central relationship of the upcoming and controversial fictionalized film. Anyway, I thought it was a tight, compelling documentary. The archival footage felt very intimate - likely in part due to Nina Simone's intensity - but I think also some very thoughtful and artful editing. A really complicated and tragic person but someone who managed to make a huge impact on the civil rights movement and be such a musical innovator and virtuoso. I knew the basic outline of her story, but I was glad to see more of her through this lens. 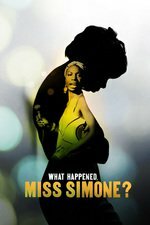 I just saw The Amazing Nina Simone at a film festival and in the director's talk afterward, he mentioned this Netflix documentary which was authorized by her daughter. I'll have to check this one out, from what he said, it's more critical of Simone. Her daughter refused to participate with the director of TANS. Both films give a fuller picture of NS than the wrecked icon of the Live at Montreux performance ( which had mostly been my previous exposure to her).